Kingston upon Thames KT Steam, Dry Leather & Upholstered Sofa Cleaning | Quality Property Care Ltd.
Commercial and domestic upholstery cleaning in Kingston upon Thames KT! Do not hesitate to rely on our tested, well-trained and expert upholstery cleaners. Get in touch with Quality Property Care Ltd. company on 020 3746 4287 right away to reach our customer service representatives. Our commercial and residential upholstery cleaning services are accessible 365 days per year - with no exception for weekends or holidays! Purchase more than one service and get a discount! 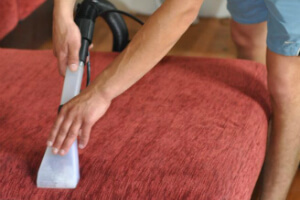 Unlike most expert upholstery cleaning companies, Quality Property Care Ltd. has developed only two special treatments. They are upholstery cleaning services inKingston upon Thames KT that are devoted to the luxurious leather sofas and the delicate suede sofa cleaning. For leather cleaning we offer crack filler with leather rejuvenator, different colours, mat leather and foam leather cleaner. As to the suede upholstery, we can sanitize suede, velvet and other delicate materials. Here dry cleaning is used to protect the fibers from damaging and tearing. There are materials like sued that do not take too well to steam and high pressures, they are far too easily harmed and can be quite tricky to properly clean. This is why we use a dry cleaning agent which we apply utilizing a fine brush to imbed it into the fibers of the upholstery. Before this is done, however, the entire sofa is cleaned with a hoover to remove any solids and hairs from the stained area. It allows raises up the fibers making them more receptive to the detergent, ultimately causing less stress to the material and the cleaners. If needed the stain is pre-treated with a special agent which helps it dissolve the material and separate it from the fibers of your sofa. Depending on the stain it might have to set for 10 mins or so, this allows it to react properly and eliminate any artificial pigmentation and colouring that might stain the fibers even further. Once set we use a high power vacuum machine to extract the detergent, the filth and the stain around and leave no trace aside from clean upholstery. There is no drying required and the detergent that we have used is fully removed so the sofa is ready to be used as is, without any chance of colour bleeding or moisture transfer to your clothes. To book Quality Property Care Ltd. professional sofa and upholstery cleaning service in Kingston upon Thames KT, give us a call at 020 3746 4287. Our customer service team is available, ready to accommodate all of your needs and address any cleaning or booking concerns you might have. Use the booking form at any time to get an immediate booking or get an answer quick, free of charge and with no delay.